Hello all!!! 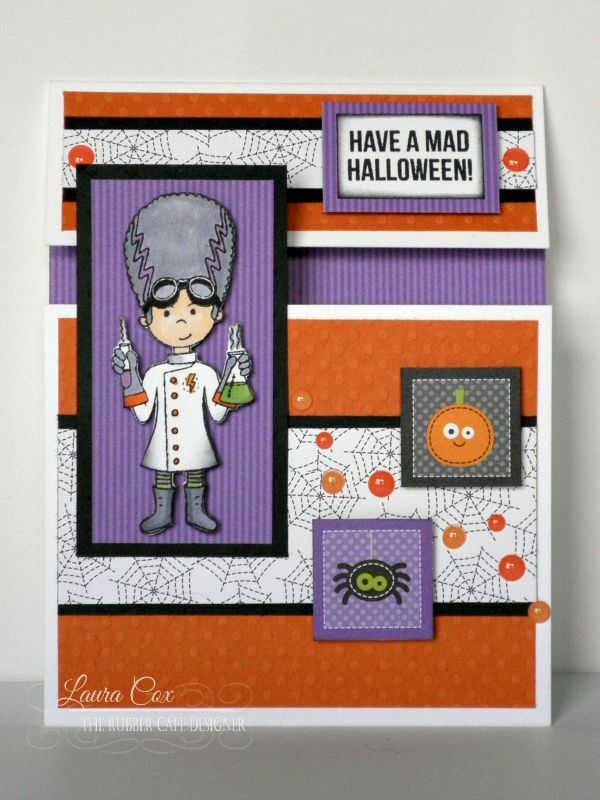 So much spooktacular inspiration this month from the September Creative Cafe' KOTM!! 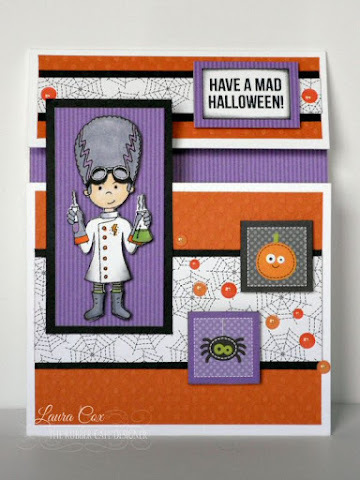 Today I've got a little mad scientist fun to share with you! Base Layer: This is a standard A2 size (5&1/2" by 4&1/4") but it's cut and scored a bit differently. Start with a 10&1/2" by 4&1/4" piece of white cardstock. Score at 1&1/2" and 7". This will leave you with a 1/4" gap in the front of your card. First Layer: On the top flap--add a 4" by 1&1/4" strip of orange swiss dot cardstock. 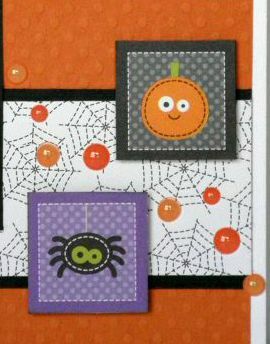 On the bottom flap--add a 4" by 3&1/4" piece of orange swiss dot. Glue using Scrap Happy Glue. Next Layer: On the top flap--mat a 1/2" by 4" piece of spider web patterned paper onto a 3/4" by 4" piece of black swiss dot cardstock. Glue to center of flap and add an enamel dot at each end. On the bottom flap--mat a 1&1/2" by 4" piece of spider web patterned paper onto a 1&3/4" by 4" piece of black swiss dot cardstock. Glue to center of bottom flap. 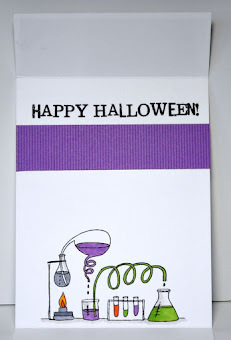 Stamp the mad scientist and the sentiment on white cardstock using Memento Black Tuxedo Ink. Color scientist with markers and fussy cut out. Trim sentiment down (about 1&1/4" by 3/4"), brush edges with black distress ink, then mat on a 1&1/2" by 1" piece of purple strip patterned paper. Foam tape the sentiment to the upper flap. 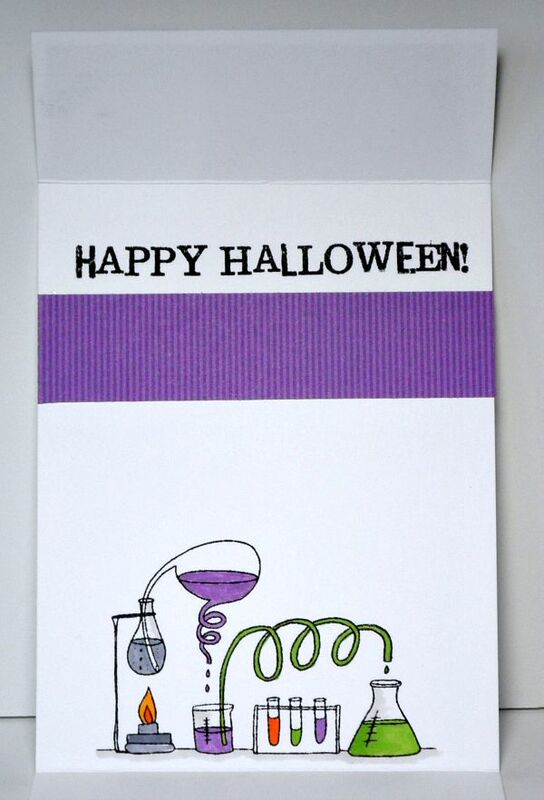 Cut a 1&1/2" by 3" piece of purple strip patterned paper, mat onto a 1&3/4" by 3&1/4" piece of black swiss dot cardstock. Foam tape mad scientist to this piece. Then glue to the card front on the left side. Cut out two of the little squares from the paper pad (I chose the pumpkin and the spider) and foam tape these to the card. Add a random sprinkle of enamel dots between. 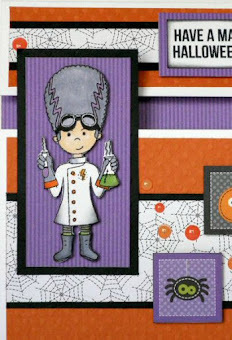 For the inside of the card, cut a 1" by 4" strip of purple strip patterned paper and glue under the space on the card front (this is about 1" from the top of the inside of the card. Stamp the Happy Halloween sentiment above it. 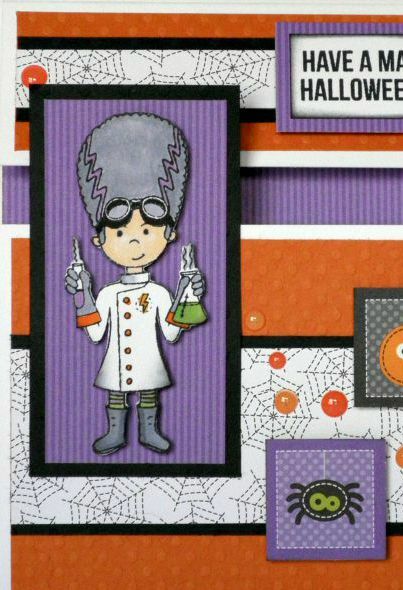 Then stamp the lab scene on the bottom edge of the card and color with markers to finish the inside. Thanks for stoppin' by today! I'm having so much fun with this kit....hope you are too!